That the Islamic radicals in Bangladesh are bold enough to hold the nation to ransom on any single pretext became evident once again when thousands of them, brandishing lethal weapons, chanting anti-government slogans marched to protest Awami League’s alleged bid to “restoration of secularism” in the constitution. 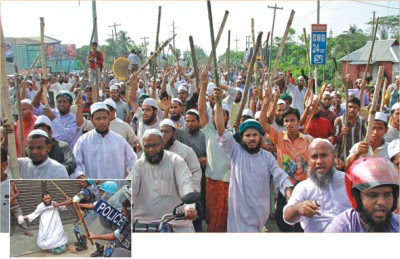 The most vitriolic of them was witnessed in Narayanganj, especially in areas like Kanchpur, Panchabati and Fatullah, where Muslim cadres virtually clashed with police and damaged properties while venting their protests. It was just the first day of 30-hour nationwide strike. What made cadres, having adolescents even, audacious enough was the comprehensive support of an alliance of 12 Islamist parties, determined to protest “restoration of secularism” in the constitution and carry on the strike as a result. Police handled the crisis strongly and responded with tear gas shells and rubber bullets since a few rampaging activists attacked the law enforcers and snatched from them a pistol, a shotgun and a wireless set, and dashed those. As per latest reports, there were heavy injuries of 120 people, including 17 policemen owing to indiscriminate attacks from Islamic hard-line cadres. But what amazes all is that the protest march took place even if the constitution has retained Islam as the state religion and Bismillahir Rahmanir Rahim earning wrath of Hindus and other minority groups with secularists. It has been learnt that the shocking violence displayed in Narayanganj took place under auspices of Islami Andolan Bangladesh or IAB. Militant activists of IAB, majority included local madrasa students, started gathering in the areas since early morning. Many of them were seen to crouch on the Dhaka-Chittagong highway stranding many vehicles on both sides of Kanchpur Bridge. Lots vehicles were simply smashed too. Bangladeshi citizens are apprehending the worst.